Miriam Okello is finance controller, CVT Nairobi. My work at CVT Nairobi is to ensure smooth running of all program activities by making sure we have required funds and resources to run the program efficiently. In my role as financial controller, I am the link between CVT’s financial department in the U.S. and our programs here in Kenya. As the financial arm of our organization, I make sure my colleagues in Nairobi and other program locations in Kenya get what they need to be effective in running the program. Today, CVT Kenya has programs in Nairobi and Dadaab, as well as a new program in Kakuma. One of my duties is to prepare financial projections on a monthly basis for the three programs in liaison with the finance officers for programs located in Kenya, and ensure required funds are available for all activities in all the locations. Because we are donor-funded, it’s my responsibility to ensure we issue reports on all spending. It’s critical to account carefully for the funds and to submit reports in a timely manner. One of our donors’ requirements is to submit quarterly financial reports. Failure to submit accurate reports on time could affect future funding or result in a reduction in funding for current work. In addition, timely reporting helps us ensure we have funds on time from the donors, which in turn enables us to carry our activities as scheduled. For example, we have to ensure there is available transport and program supplies for clients to enable them come to our centers for counseling sessions, because if we cannot arrange transport for them, most of them may not come for the sessions and we won’t be able achieve our goals as written in our proposal to donors. I ensure that our expenditure is within the budget presented and approved by the donors. When our last grant cycle ended, one thing came out clearly: we spent within our budget. We didn’t return money or go over on spending. It’s a good feeling to know we spent within the funding amount while also meeting our program targets. Besides this, I also ensure compliance with local authorities in terms of reporting and taxation. This is very critical for us because noncompliance with the local government requirements may lead to deregistration of the organization as well as payment of heavy fines and penalties. I also ensure staff as well as local suppliers are paid their dues on time to enable smooth provision of resources and services. I have worked before in other organizations as an accountant and an auditor, both commercial and humanitarian, before I came to CVT. I worked as an accountant in a large manufacturing firm and also worked in other large international non-governmental organizations (INGOs). The practical skills and experience I acquired in these organizations have been useful in my current role and responsibilities. I was attracted to work for CVT because of the work with refugees. In different areas and within other organizations, there are some supports for refugees, goods or services that the Kenya government is not able to provide. For example, I worked at Save the Children, where there are a variety of services. However, at CVT it is rehabilitative care that makes a difference. 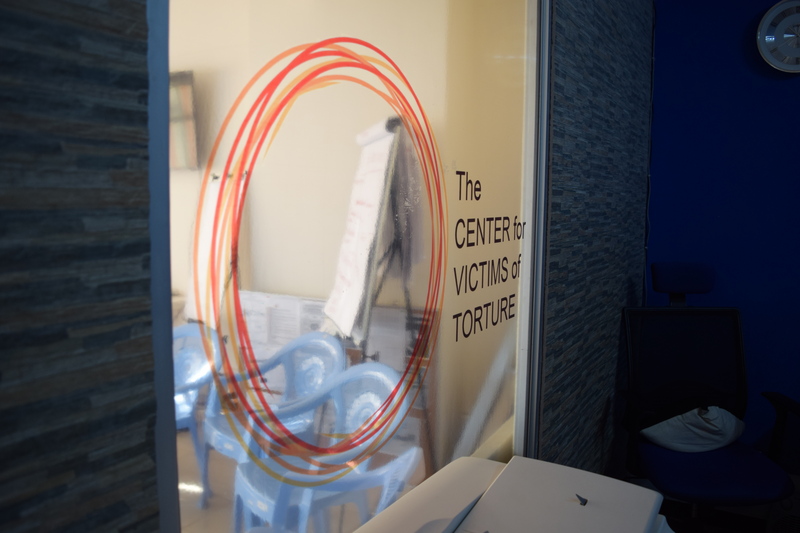 CVT contributes positively for refugees who come here with mental health and physical needs from torture and trauma. Even if these individuals find material things like food, clothing and shelter, they will still have psychological problems. Material goods help people – those are important. But problems with mental health can affect their overall health, productivity and their social life. That’s where CVT steps in. CVT helps survivors accept what happened and helps them overcome their past by giving them hope for the future through counseling. Through our care, survivors of torture can begin to forget the past, bring themselves into the present, and then move forward. The first part of the year is a very busy time for the finance office here in Nairobi. We are in the middle of an audit at this time, which is a requirement of the Kenya NGO board which supervises our work here in Kenya. This is a very large project. As a requirement, all NGOs must file returns annually, with audited reports required as part of the filing. These reports include information such as number of staff, number of clients, program targets, as well as audited financial accounts. In this audit, we ensure we are within the limits and that we are compliant with the NGO board of Kenya. This filing is very important to maintain our access to services, such as work permits for ex pats, and other services offered by NGO coordination board. There is always a lot of work to be done, but I have great satisfaction in being able to accomplish what I need to do within the right time. I appreciate the work of CVT. I hope that in the future – I wish – we will be able to expand our service to help many more local people going through mental health problems resulting from stress related issues, beyond refugees who have survived torture. Many people need the kind of care we offer. In Kenya there are lots of suicides and families coping with difficult social and economic issues with many suffering from stress and trauma related ailments. It is not just torture survivors who need mental health care and physiotherapy; the services would be good for Kenyans as well.